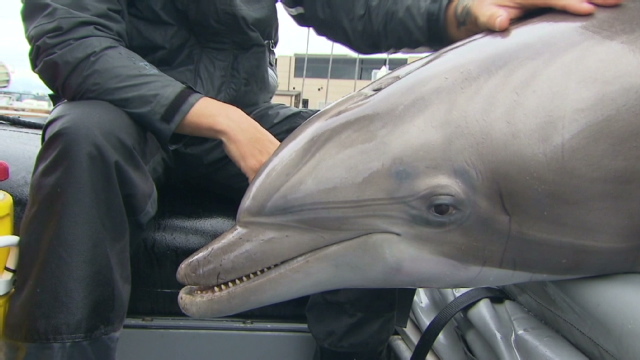 CNN investigative correspondent Kaj Larsen hits the seas for some scuba with the U.S. Navy marine mammal unit that trains dolphins to detect and intercept swimmers who could be potential terrorist divers. Dolphins also sweep the bottom of harbors for mines and other animals recover sensors and inert torpedoes from deep in the ocean. National correspondent Gary Tuchman reveals the inside life of Warren Jeffs, the leader of the breakaway fundamentalist Mormon sect, FLDS, who is accused of polygamy and child endangerment. As attorneys prepare opening statements for the upcoming trial in San Angelo, Texas, Tuchman details the hold that Jeffs still has over his followers – even from behind prison bars. Also, correspondent Amber Lyon reports on pain pill-addicted babies who are crowding Florida hospitals as so-called ‘pill mills’ – clinics and medical practices that dispense prescriptions inappropriately – continue to flourish. Federal drug authorities consider the State of Florida among the states with the largest problem with inappropriate prescription drug use. This edition of CNN Presents will debut Sunday, July 31 at 8:00pm ET and PT. It will replay on Saturday, Aug. 06 at 8:00pmET and PT.